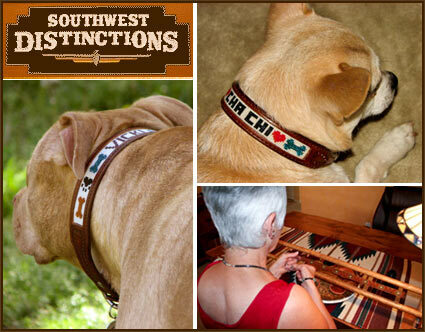 Southwest Distinctions offers unique handcrafted dog collars that can be customized to your personal tastes. At Southwest Distinctions, you will find stylish, upscale, hand crafted inlayed beaded leather dog collars and beaded leather belts in a wide range of designs to reflect your personal style. Southwest Distinctions has been hand-tooling leather for the past 20 years creating stylish, upscale, hand crafted inlayed beaded custom leather dog collars and belts. Don and Barb Mohr, CEO's of Southwest Distinctions, are committed to handcrafting inlayed beaded leather dog collars and belts that reflect your personalized style. Don has always had a great interest in the art of hand-tooled leather for the past 20 years has used his talents creating unique leather products. Don individually designs and handcrafts each dog collar and belt while Barb does all the hand beading. Working together as a team allows Don & Barb the opportunity to make a superior hand made quality product. Each collar is custom made to the exact size and all collars come with beautiful stainless steel buckles. We start out designing the bead patterns on the computer with a special bead program. Don is extremely talented in designing patterns and once the pattern has been designed we print the pattern and this printed pattern is then used as a guide for Barb to follow. Barb hand beads all of these patterns on a loom we use very small (size 15) glass beads. The small size bead allows us the opportunity to bring in more detail to our patterns. This differentiates our product from competitors because the small bead sizing allows for the greatest customized detail that you wont find anywhere else. Once this strip is beaded it is then ready to be inlayed between 2 pieces of leather, which results in a beautiful dog collar that will last! Why Should I Buy Your Product Over A Competitor? You should buy our products because they are customized and designed uniquely just for you! Because each collar is custom made our customers have the opportunity to choose the color beads, color leather, and bead pattern they would like. Each customer can mix and match as they see fit along with adding a name or even a brand. We start with a whole side (cow hide) of natural strap leather. Each leather strap is hand stamped and hand dyed the beaded strip is inlaid between two pieces of leather this process protects the beaded strip All of are collars are then stitched; the edges are also hand dyed and hand rubbed. Leather colors that are available are, Natural (drakes) Brown, Black, and Red. As for bead colors your choices are virtually endless. How Do I Determine Which Size I Should Choose For My Dog? Ensuring the fit of collar your dog wears is as important as well fitting shoes. To be sure that your dog’s collar gets the best fit, the width will be determined by size of the collar (3/4”, 1”, 1-1/4”). Measure using your dog’s current collar measurement (if it fits correctly) lay the collar out flat and measure from the adjustment hole being used to the center of the buckle. This allows adjustment for larger or smaller. Our collars are sized according to this measurement, not to the over-all length of the collar. We have found that this is usually the most reliable measurement to use. The leather is hand crafted with inlayed beaded natural leather product, which requires some care to maintain the beauty of the hide. Do not use soap or soak with water this may cause staining. If cleaning is necessary we recommend a quality leather cleaner and please remember these collars should not we worn while swimming. How Long Will It Take For Me To Receive My Product? Because each collar and belt is handcrafted with a unique process, time is required to produce an exceptional product, this being said we do require a 3 – 4 weeks lead-time for our dog collars and 6 weeks for our belts. We do understand many of our customers may be attending either a dog show or horse show so if a specific date is needed we do our very best to work with the required dates. However at the same time if we do get a large backlog of orders we do our very best to get the order shipped as soon as possible and will always keep in close contact with our customers. What Do Customers Say About Southwest Distinction Custom Collars? When I received my collars for my three dogs, I was in total amazement. These collars are absolutely gorgeous! These collars are made out of the best quality leather and there is not a picture that can do these collars justice into the amount of detail and craftsmanship that are put into these collars. They are absolutely stunning and my dogs are getting complemented everywhere we go. Thank you for the beautiful collars and I would recommend your work to anyone who is looking for a truly unique and special collar for their canine companion. I can’t thank you enough for the incredible collar that you guys made for Leo! Everybody that I have shown it to thinks as I do – that it is absolutely exquisite, truly stunning. Thank you for the beautiful dog collar, your workmanship is outstanding, please feel free to use my name as a testimonial! Order Your Southwest Distinction Collar Today! Give you dog a unique hand crafted leather collar that will stand out from the rest! With a Southwest Distinction Collar you can personally customize your collar to fit your taste and style at an affordable price. So what are you waiting for, order today!